Bright vibrant colors in the stained glass wall give a cheerful feel to the open concept reception area. Parked in the reception area, this is a school bus kids want to jump aboard. They can climb inside and enjoy movies while they wait. Few kids would tell you that a dental visit is “fun” but for the pint-sized patients of Just Kids Dental, that’s an accurate description. 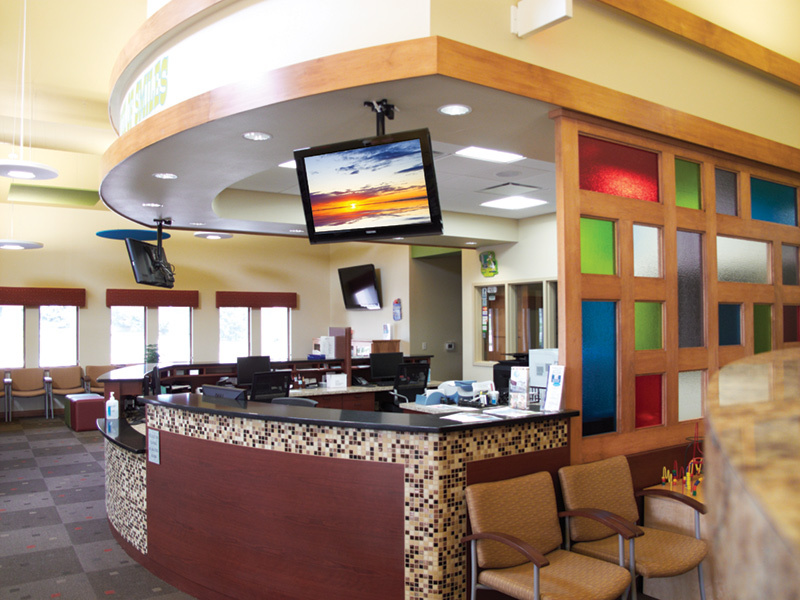 The Sheboygan, Wisconsin pediatric office is not just comfortable; it’s an explosion of color and kid-friendly activities and spaces that grab the children’s attention the minute they come in. The waiting area is all about making the patients feel comfortable and happy. With bright fabrics and window treatments as well as vibrant stained glass inlays in the walls and whimsical lighting fixtures, the entrance is cheerful and bright. 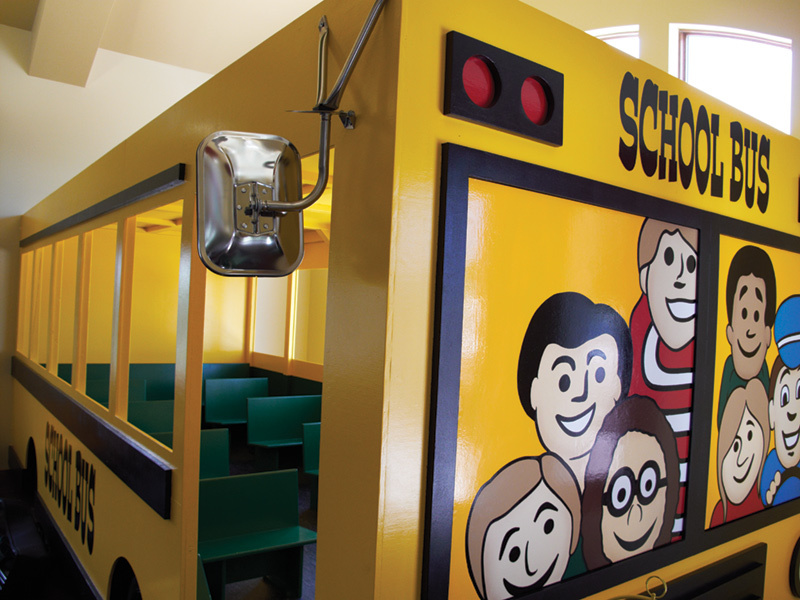 The waiting area features a creative coloring station and a custom-built school bus that invites kids to climb inside. 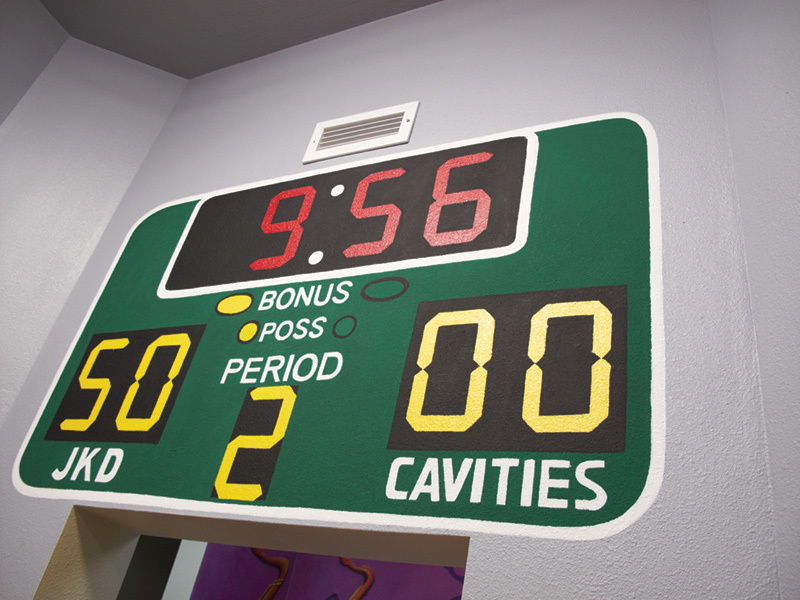 The bay area includes a kid-sized basketball court where patients can try to outscore Team Cavities, and a built-in floor piano (inspired by the movie, Big) that “plays” as patients walk across it. 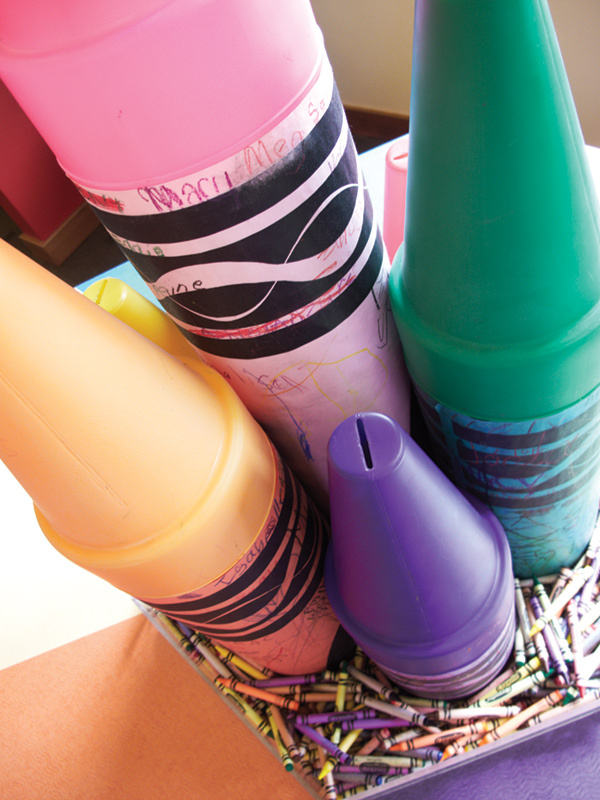 If children are nervous when they come in, it’s quickly forgotten as they enjoy all of the activity areas, allowing parents to fill out paperwork without distraction and relax with a beverage from the coffee bar. 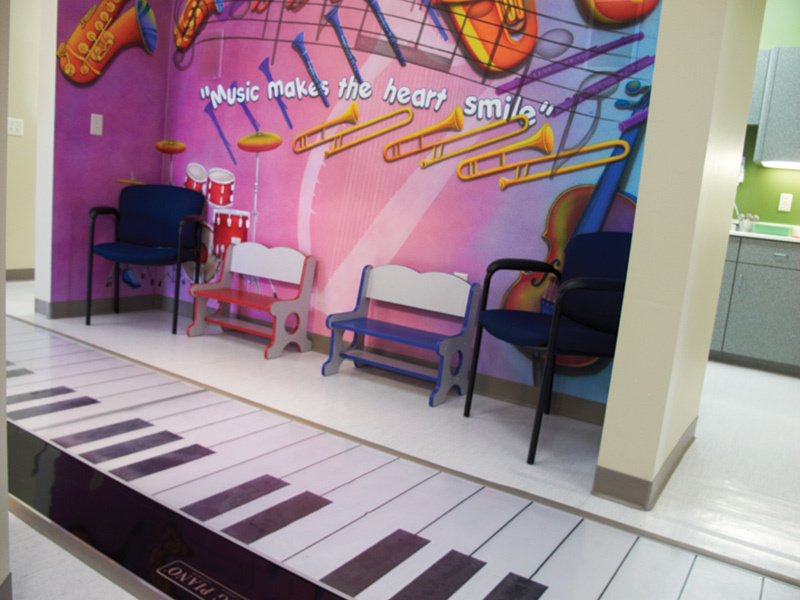 “The patients and parents are thrilled when they walk in. The kids immediately leave their parent’s side to explore the fun things in the waiting room, leaving the parents time to be greeted, check in and fill out information,” says Dr. Jaime Marchi, who built the new 9,000 square foot office in 2011. Four-octave in-floor piano in the music area of the bay area. 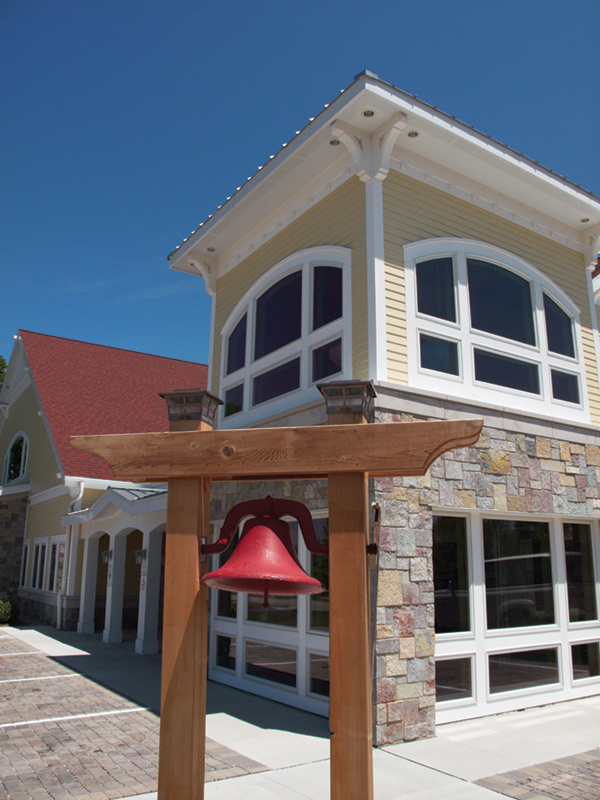 The schoolhouse theme extends to the Cape Cod architecture and bell outside, which is actually rung to celebrate a “no cavities” visit. 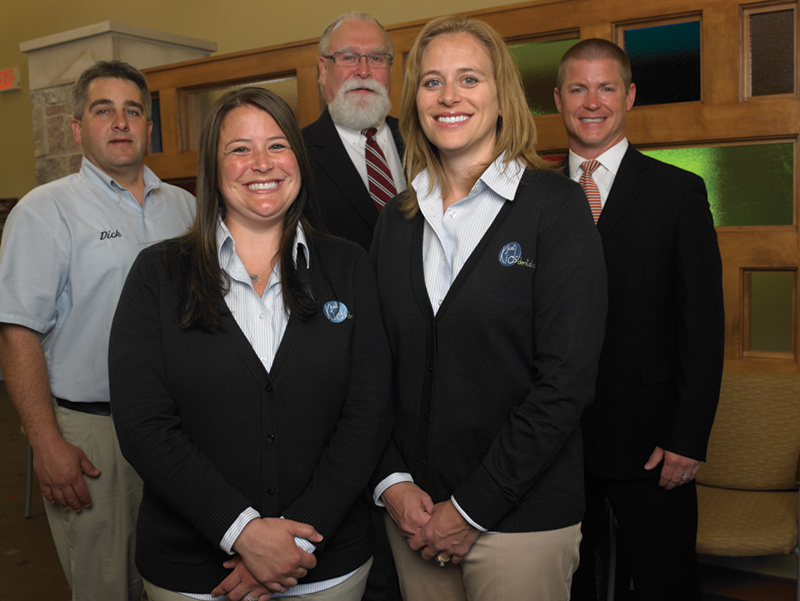 Dr. Marchi’s practice opened in 2002 and was the first pediatric dental practice in Sheboygan. But as the patient load and staff grew, the space became tight – there were just five chairs for patients, the business areas and treatment areas were too small, and the checkout created bottlenecks. Interestingly, even though the space was cramped for Doctor Marchi and her team, the office layout was too open and didn’t provide enough privacy. The final decision to build a new office came when her sister, Dr. Andi Igowsky, entered pediatric dentistry. Dr. Marchi knew that eventually her sister would join her in the practice, so she purchased land in 2008 in a highly visible location. The new building would solve the space and layout issues, allow two doctors to practice simultaneously, and would also open the door to new technology and innovative décor that would appeal to children. 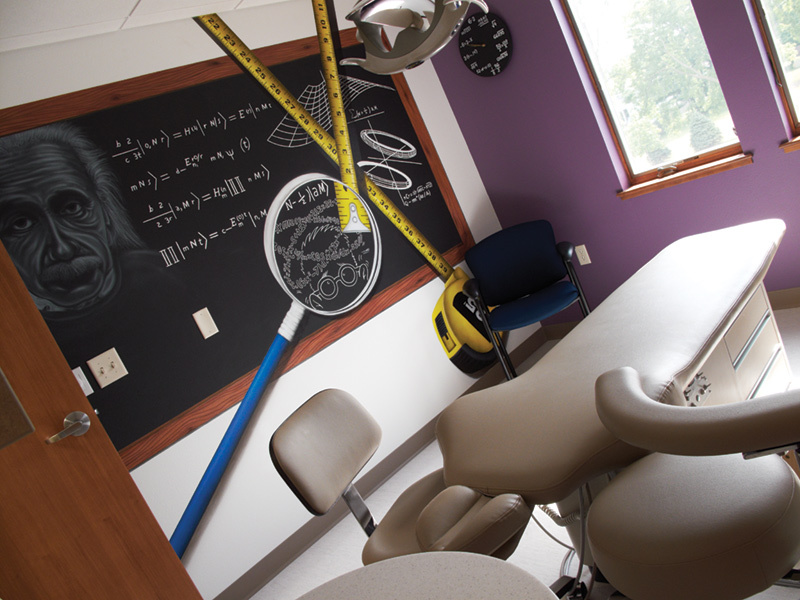 Patient care areas come to life with whimsical murals that enhance the schoolhouse theme. 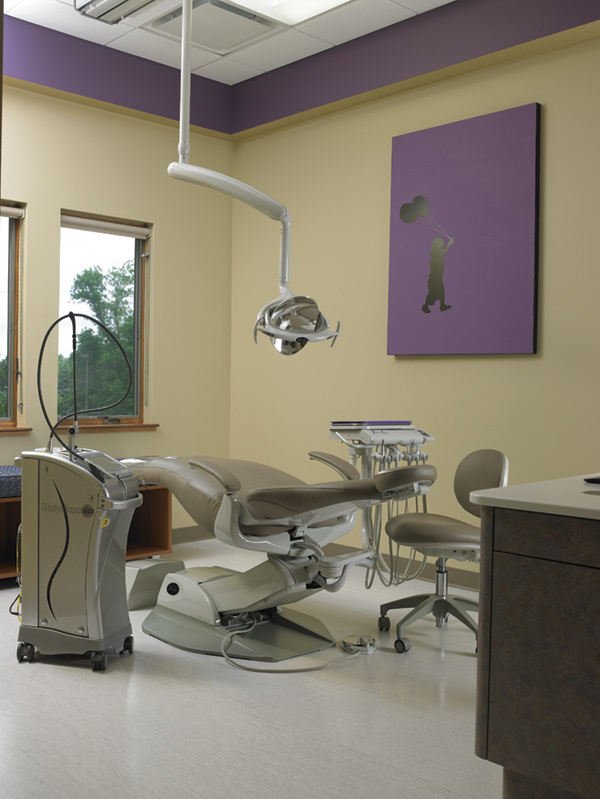 She worked with Henry Schein Equipment Sales Specialist Dan Kroeger and Henry Schein’s National Design Group to put her ideas into a precise plan that addressed the needs of the practice while also providing a delightful experience for patients and their families. Today, when you drive up to the Just Kids Dental office, you might think you’re entering an old-fashioned schoolhouse, complete with a tower and bell that the patients can actually ring! However, when you enter the practice, there is nothing old-fashioned about it. It’s state-of-the-art, bright, and is decorated with a school theme throughout. 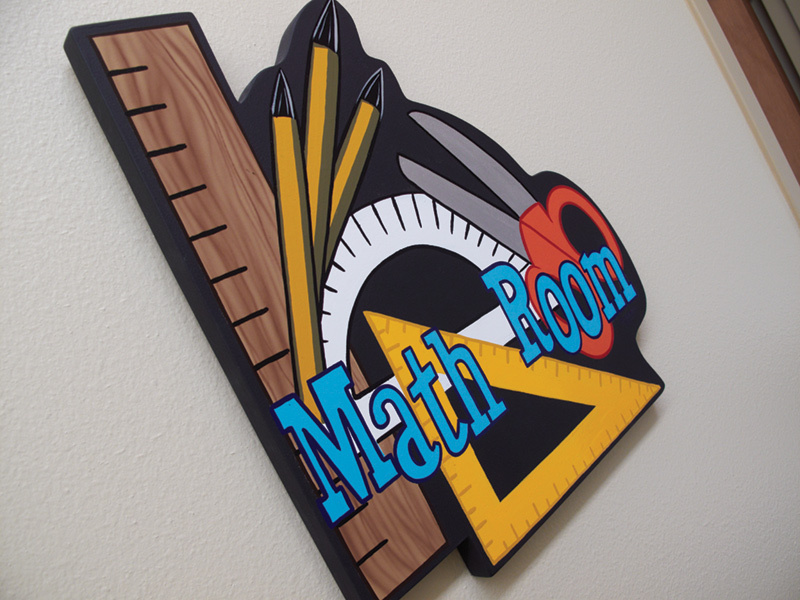 Each room in the practice is named after a room found in a school, such as the music room, math room, and even the principal’s office! Patients are treated to a different quote in every room; all quotes contain the word: smile! 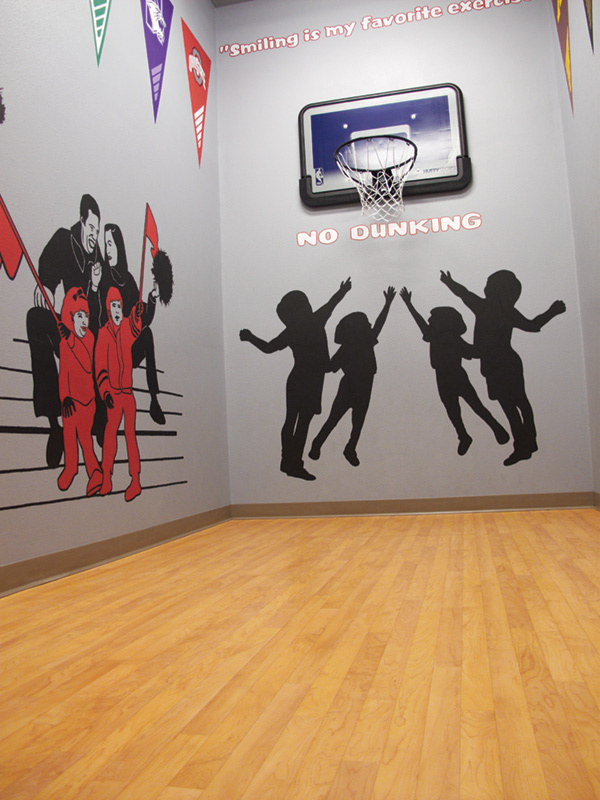 Every room in the practice is named after a room found in an actual school. Smiling comes easy for Drs. Marchi and Igowsky because the layout and upgrades to equipment and technology have made the office more comfortable and definitely more productive. 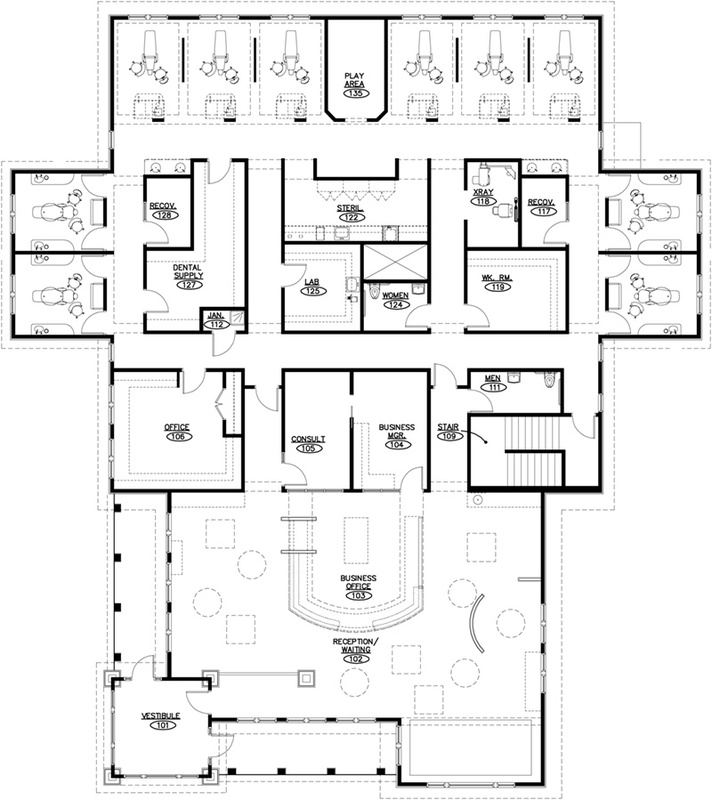 Working together, Dr. Marchi and Henry Schein’s design team created an office that is unique, but also flows smoothly in a circular route so bottlenecks have been eliminated. With 10 chairs in the new office, spread out between open bays that accommodate multiple family members, and four quiet rooms set apart for children who need a more soothing environment or are being treated with sedation dentistry, there’s plenty of space for both Drs. Marchi and Igowsky to be fully scheduled on the same day, something that was difficult in the previous location. The office is outfitted with chairs, cabinetry, and lighting from Pelton & Crane. Each space is comfortable, attractive, and designed with both right- and left-handed capability, which is particularly important because Dr. Marchi is right-handed and Dr. Igowsky is left-handed! KaVo handpieces and electronic scalers provide greater comfort and productivity for the staff, but are also quieter and less intimidating to the young patients. The new location incorporated a SOREDEX CRANEX D digital pan/ceph and SOREDEX DIGORA Optime phosphorus plates – and all of the digital images are displayed on the chairside screens, allowing parents to easily understand proposed treatment. The centralized sterilization and storage areas, like the rest of the practice, were designed to be easy-in, easy-out, allowing the assistants to work more efficiently. The abundance of computers at every workspace also allows the staff to schedule appointments while patients are still in the treatment areas, making checkouts faster and preventing back-ups. Strategically placed in the bay area near the operatories, the basketball court is a key part of the patient workflow, giving patients a fun, but out-of-traffic spot to wait. If there’s one thing that most parents value, it’s convenience, and Just Kids Dental has embraced technologies that make it easier for parents in a variety of ways. The office adopted Demandforce, which integrates with the practice management system to send appointment reminders via e-mail and text message and then receive confirmations back from the patients in the same way. Dental forms can be e-mailed ahead of time, allowing parents to fill out the paperwork at their convenience instead of when they arrive. In addition, check-in and paperwork updates are done on iPads, which is faster, easier, and eliminates the need for the filing and storage of paper. 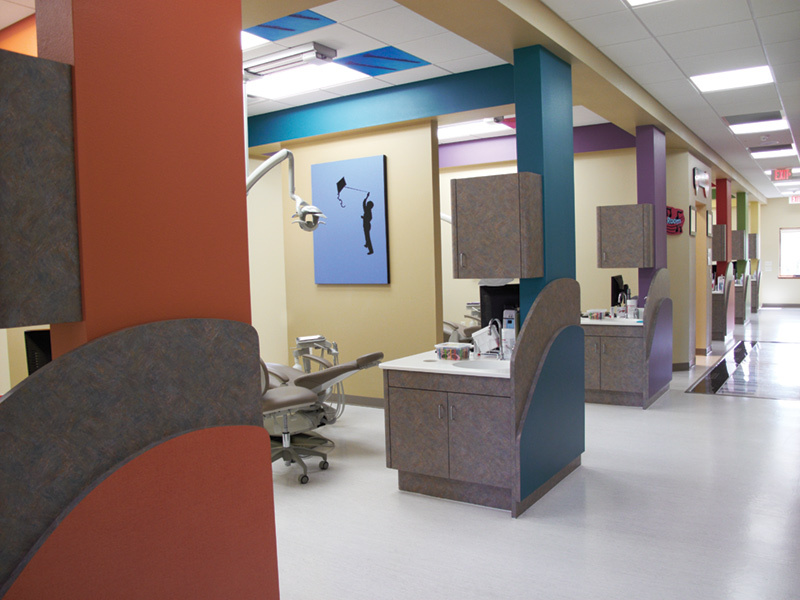 Open-bay hygiene area allows for easy-in, easy-out for the patients and staff. 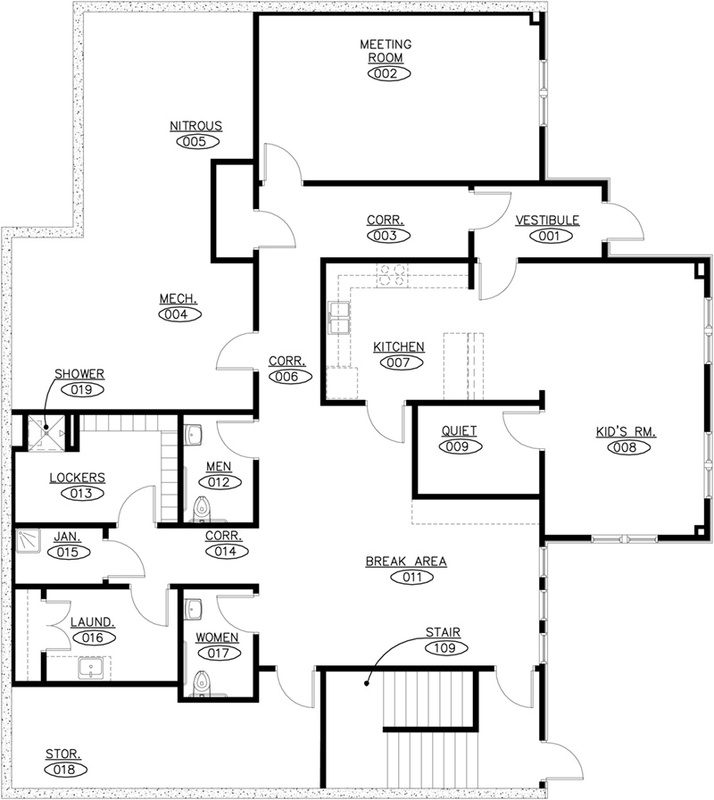 The sterilization area is walk-through and easily accessible. Equipped with Midmark, KaVo, and SciCan. Dr. Marchi explains “From a business aspect, we have gone completely paperless, which is a huge accomplishment!” It’s no surprise that the practice is earning rave reviews via Demandforce from patients, and that the kid-centric activities are a favorite. But, patients are also sharing their positive experience at Just Kids Dental with friends and family. The operatories are equipped with Pelton & Crane chairs, Helios lights and KaVo handpieces. 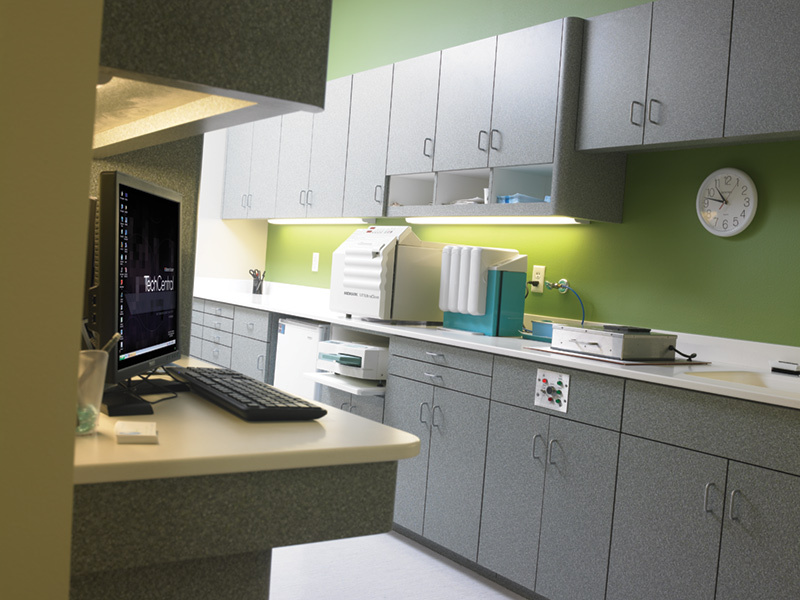 Dr. Marchi began the planning process for her new office three years before it was completed, working with Dan Kroeger and the Henry Schein National Design team. Today the office enjoys greater visibility, a “wow” factor that has kids and their parents talking, and the latest technology that is easier to use, requires less maintenance, and delivers a superior level of care to patients. Like most moves, relocating the practice did have some stressful moments, but now that the doctors and staff are acclimated to the new office, it is actually more relaxing and less stressful. 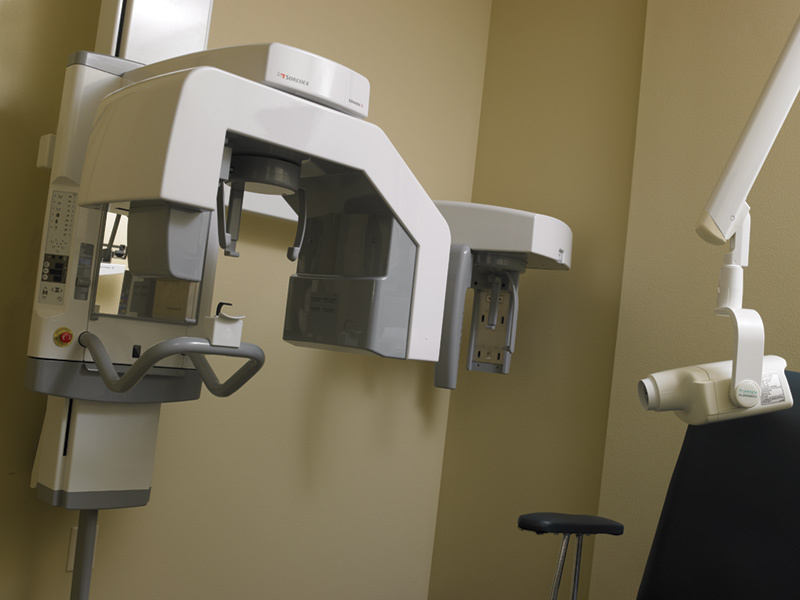 Digital imaging includes a SOREDEX CRANEX D pan and ceph.